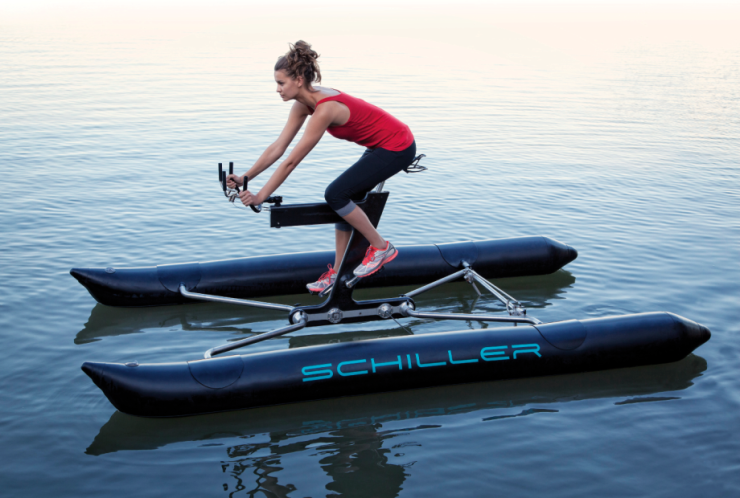 Schiller X1 Water Bike Takes Your Workouts To The Lake | OhGizmo! By David Ponce on 08/18/14 • Leave a comment! If cycling is your thing, but you’ve seen every road and carved every curve, maybe it’s time to take the sport to the water. The Schiller X1 Water Bike lets you take the thrill of riding on to the open water, where its high end anodized, powder coated aluminum cycling frame, proprietary two-stage 8:1 gear reduction with Gates Carbon Drive belt system, and twin rudderless pontoons will allow you to get up to 10 miles per hour. It’s easily assembled and disassembled in 10 minutes, and weighs about 45 lbs. so it can be transported with ease. Just slip it into your car’s trunk, drive to the lake, and go for a ride on the water. This is a high-end product, with premium components, and of course a premium price: the standard X1 will set you back $6,495 while the limited “Founder’s Edition” (250 units) clocks in at a hefty $8,775. Your purchase does come with two year’s worth of free component and accessory upgrades.